We have a great event in partnership with the World Affairs Council on Wednesday, March 16th at 6:30. 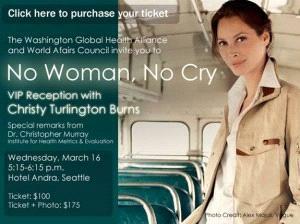 We are co-hosting the Seattle debut screening of Christy Turlington Burns’ documentary “No Woman, No Cry”, at the Cinerama, followed by a panel discussion featuring Gary Darmstadt, Director of the Family Health in the Global Health Program at the Bill & Melinda Gates Foundation, Craig Rubens, co-founder and executive director of the Global Alliance to Prevent Prematurity and Stillbirth (GAPPS), an initiative of Seattle Children’s and Chris Elias, President and CEO of PATH, along with Ms. Turlington. Also, in advance of the screening, there is a special VIP reception at the Hotel Andra. See the invitation below for more details. Volunteer opportunity for pre-health artists!